The Colomba with Chocolate Chips from Bonifanti is topped with a delicious hazelnut glaze and garnished with whole almonds and sugar granules: sure to tempt any gourmet with a sweet tooth. The traditional dough, made from flour, sugar, butter and fresh eggs, is enriched with delicious chocolate chips, giving it wonderful sweetness from the very first bite. The dough for the Bonifanti Colomba is allowed to leaven slowly and naturally, creating a product that is especially soft, fragrant and easy to digest. It contains no raisins or candied fruit. 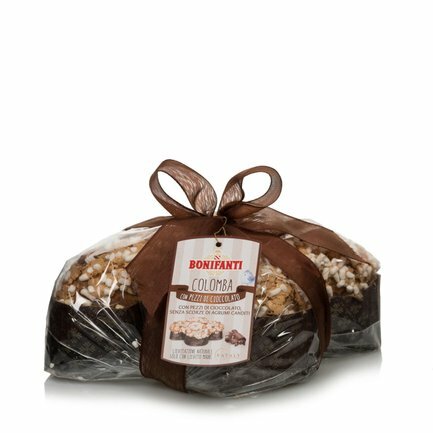 To enjoy the Bonifanti Colomba with Chocolate Chips at its best, leave it in a warm place before eating: this will reveal all its intense flavour. Ingredients Wheat flour, sugar, chocolate drops 13,6%: (sugar, paste of cacao, cocoa butter, soya lecithin, natural vanilla extract), water, butter, sugar grains 7,2%, fresh egg yolk, natural yeast sourdough (contains wheat), almonds 3,9%, fresh egg white, hazelnuts 1,5%, emulsifier: mono and diglycerides of fatty acids, rice flour, inverted sugar syrup, honey, cacao butter, milk powder, salt, rice starch, natural orange flavour, vanilla beans from Madagascar. For more information on product labels, please contact our Customer Service department. The information on the labels of the products may vary for reasons beyond our control, therefore, there may be discrepancies between the information on the site and that on the products delivered. Please always check the information on the product before consumption or use.